of the tip on each string. and wrist to shift and press. with my fingers, too thick, too short, too small. for me more than I ever can. to give me a voice. 1) Korean Folksongs Mash Up arranged by Emily Jiang. Performers: violin, Hannah Druckman; cello, Mary Tusa; piano, Emily Jiang. 2) I Shall Keep Singing! text by Emily Dickinson, music by Emily Jiang. Choir: Sara Asher, Victoria Chang, Lisa Collart, Charlotte Daly, Hannah Druckman, Sarah Etheredge, Yiting Jin, Cathleen Kalcic, Elise Kent, Renee Ting, Mary Tusa. Conductor: Emily Jiang. 3) Beauty Is text by Emily Dickinson, music by Emily Jiang. Choir: Sara Asher, Victoria Chang, Lisa Collart, Charlotte Daly, Hannah Druckman, Sarah Etheredge, Yiting Jin, Cathleen Kalcic, Elise Kent, Renee Ting, Mary Tusa. Conductor: Emily Jiang. 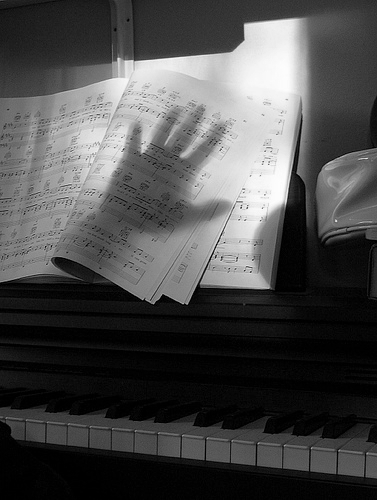 Photography: adapted from my piano, my hand, my music, by zen Sutherland.